It's time for the New Product Launch! All the Stamps, Die-namics, and Stencils can be found HERE. 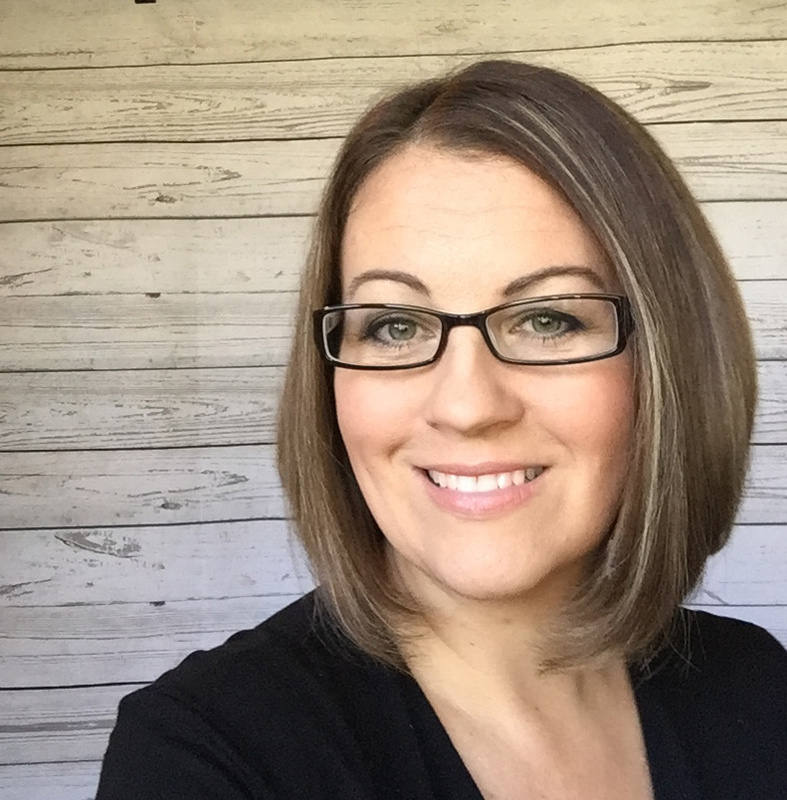 Please remember to visit each of the MFT Designers' January New Product Launch posts on the MFT Blog and leave a comment by the end of the day on Thursday, January 12 for your chance to WIN one of two, $100 Gift Vouchers. Ready? Set. Comment! I have three cards to share with you today, they all feature the gorgeous Floral Fantasy Background. I am obsessed with this stamp! For all three cards, I inked up the background with Versamark and stamped the image on a piece of Smooth White Card Stock. I then embossed the image with White Embossing Powder. I then brushed various Hybrid inks over the image with the Clarity Stencil Brushes. I find the Hybrid Inks blend together really well. All three cards were framed with the Stitched Rectangle Frame Die-namics. On the final card, I die-cut the stamped background piece with the Heart STAX Die-namics instead of using it as the background piece. Ooo, wow! Really pretty! Love your clean design and coloring. Such beautiful cards! 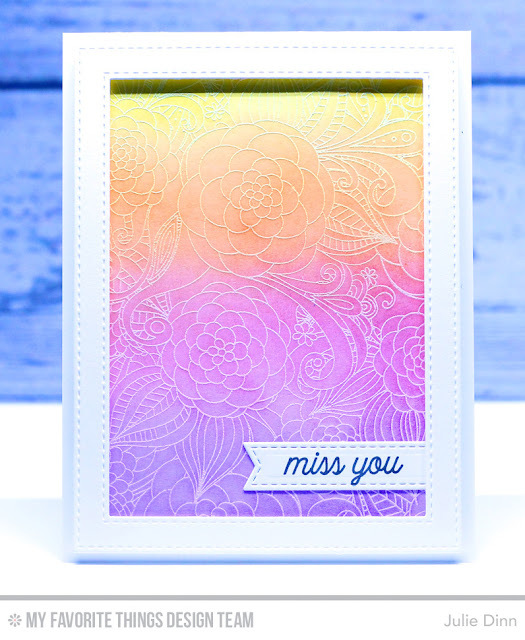 I absolutely love the different ways you have used the Floral Fantasy background stamp. Well done!! Your cards are so pretty. I admit, this background stamp isn't really my style. However, your samples with it could easily be transfered to many of the others I own from MFT! Thanks for the great ideas! Pretty cards! I love how that background looks on the hearts. Oooooo Ahhhhh! Very pretty cards with that beautiful floral fantasy background!! I love your hearts cut out of that background! All of your cards are very pretty! What a great background! Your cards are beautiful, really love this background stamp. 3 Great cards, but I love the cut out heart card, so pretty and I would have never thought to do that with a background stamp! Oh wow!!! I'm defintely in love for your breathless cards!!! Love, love, love!!! This background stamp is amazing, I love your cards. Thanks for the beautiful inspiration with this fab stamp - can't wait to get my hands on it! Love this background stamp. I really love how you used it on the hearts!! Very pretty cards. 3 stunning cards - great use of the background stamp! They are all beautiful cards. This background is lovely. All your cards are fabulous! The background stamp is awesome!! Three awesome cards showing off the floral background. Amazing coloring and inspired use of the floral background for twin hearts! These are wonderful. Love the third one, die-cutting hearts from that floral background. Beautiful. Great cards. Love your blended background. really beautiful set of cards!! The third card is my favorite... but I'm partial to hearts! These are gorgeous. I love the colors on the first one. It's clear that I need more practice with those brushes. Nice job on the sponging. 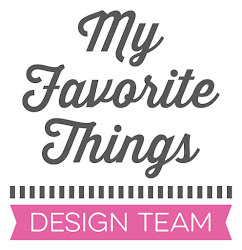 Wonderful card designs - thank you for sharing and the inspiration! Beautiful cards! Love the floral fantasy stamp! Your cards are so beautiful! I love the colors you used on them. Your heart card is so adorable. I absolutely love this background! I will be ordering this one. So many fun ways to use it. Thanks for sharing your awesome cards! Ok, I NEED that Floral Fantasy Background! The colors on the first card are gorgeous and using it on the hearts is pure genius! Soooo beautiful!! Love that Floral Fantasy stamp and the various ways you used it. Beautiful cards, thanks for the inspiration! Love all the cards but the hearts are my favorite. Great way of showing how many uses those background stamps have. You are amazing, these are so pretty! Such pretty cards! I love how you used the background stamp on those hearts! I bet that background stamp is going to be SUPER popular! I love how you used it in every card. OK...SOLD, i love how you did the hearts. WOW! Your cards are gorgeous Julie! I love the ombre effect in your cards, are so beautiful!!! Beautiful cards! You showcase that new background stamp perfectly! Oh, that stamp IS Gorgeous!! And so are your cards!! LOVE that blue one! This stamp is my favorite of the whole release & you showcased it perfectly!! Love the first two with the ombre inking, and then kudos to you...for stamping the background on some hearts!! Beautiful result & I'm not the kind of person that would think of that...thanks for the inspiration! Love your ink blending! Great cards! Love this stamp! Thanks for showing different ways to use it! Thanks for showing so many versions. 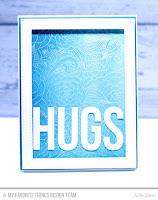 I love all of your cards, and the different ways of using this background stamp! Just beautiful! The Floral Fantasy background is amazing. I love the white embossed look with the hybrid ink. Beautiful blending, beautiful cards! I'm really loving this background stamp now. Your cards are so beautiful! I love the Floral Fantasy stamp and you used it beautifully. I really like the look of it die cut in the last card. Julie I just love all the ways you used the floral bg. Gorgeous!! I love the Floral Fantasy stamp! Your coloring is awesome! The blending of the colors is great. Beautiful colors and layering on each card! Beautiful cards! I love the colors you used! Julie, all three of your cards are drop-dead gorgeous. 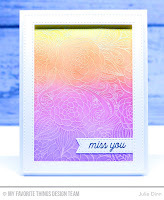 I so need that Floral Fantasy Background stamp as it is so versatile, especially seeing the different ways you used it. I'm in love! Love the use of the background stamp in those hearts! There are no other words I can use to say about all of these cards other than, absolutely gorgeous! All your cards are so beautiful! Fabulous cards, they show just how awesome that new floral background is. I love that new floral background stamp and how you created multiple looks. Thanks for sharing. Such beautiful ways you have used this background. Great ideas to use the newest background stamp, beautiful! Wow! I love all of the different looks achieved with the same background stamp!! Amazing cards and loved how you used that floral background in different ways. Gorgeous cards! Love the one with the hearts! Wow, they are all gorgeous! I love all the colors & how you used the heart dies on the last one!